There’s an upcoming national auction in mid-April that offers various coin-operated arcade games, trade stimulators, vintage slot machines and other coin-operated memorabilia. A link to the catalog is here. And while there are plenty of treasures from this auction that I would LOVE to have in my collection, one of the most fascinating pieces available in the auction is a recording studio. Yeah, you can drop a few coins into the slot and now you’re a recording star. You would record your voice – most likely a message to your sweetheart or maybe a quick doo-wop song with your buddies – and you would receive a lacquer-coated metal disc with your voice enscribed in the grooves. 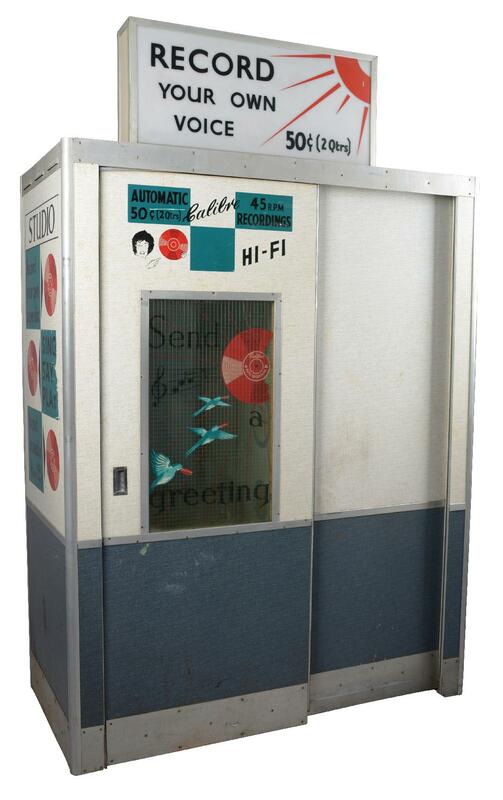 Arcade auto-recording booth allowing user to pay 50 cents and record a song or message pressed onto a 45rpm record, 1960s. Estimate: $80,000-$100,000. Photo courtesy Morphy Auctions. Now this is cool. I mean, look at it. Heck, you can even bid on it at this link. This kind of technology has existed for decades. For example, at one point in time my ex-wife’s grandfather, while he was stationed in the Army, used a booth like this to record a love message to his sweetheart – later to become his wife. My ex asked me at one point to try to recover the recording on it, but these discs don’t last well over time, and the fragile metal disc showed signs of cracking and flaking. I did the best I could, but the records these booths produced were not exactly of the same quality as Abbey Road Studios. Several of these machines have survived. Recording artist / producer / music genius Jack White has one of these coin-operated booths at his Third Man Records studio in Nashville, and from time to time he films artists as they record songs or voices in the booth. For example, here’s “Weird Al” Yankovic and his band as they record a novelty track in the Third Man Records coin-operated recording studio. I share this press release mostly because I do enjoy coin-operated machines and their actions and activities. In exchange for the loose change in your pockets or purses, you could get a quick entertaining show – whether it’s a trade stimulator that shows a simple activity in exchange for a lollipop or a cigarette; or a coin-operated “one-armed bandit” that still has the ability to separate you from your hard-earned dough, these machines are still able to entertain customers and draw crowds today. The Morphy Auctions’ press release is listed below, including information on the Calibre Auto-Recording Booth, and if you find coin-operated machines and memorabilia as fascinating as I do, perhaps there might be a treasure or two that would catch your interest. Morphy Auctions’ coin-op and advertising auction runs through April 13 and 14, and bids can be placed online. The April 12-14, 2019 auction series will be held at Morphy’s gallery, 4520 Arville St., Las Vegas, NV 89103, starting at 9 a.m. PDT each day. All forms of bidding will be available, including live via the Internet through Morphy Live. Questions: call 877-968-8880, email info@morphyauctions.com. Online: www.morphyauctions.com. FTC TRANSPARENCY NOTICE: At no time did I receive or request any compensation or remuneration or favors in exchange for publishing this information related to this auction. I do not receive any commission or funds for any items sold in this auction. Awesome article, Chuck. You always know the obscure details that no one else seems to know. I wish there were self-recording booths around today, but they’d probably cost a fortune.